The 66th CIC Detachment served In Western Europe and was awarded the Northern France campaign credit. Near the end of World War II, it became a part of the 12th Army Group under the 418th CIC Detachment. Organisation Order No. 276, Headquarters, European Theater of Operations (ETO), dated 25 Apr 45, inactivated the 418th CIC Detachment and created the 970th CIC Detachment, with 10 May 45 the effective date. On 14 Jul 45, the 970th CIC Detachment, which had its headquarters in Wiesbaden, Germany, moved to Frankfurt am Main, Germany. On this date ETO was changed to USFET (United States Forces European Theater). On 12 Nov 45, the 66th CIC Detachment, which had apparently accompanied the 66th Infantry Division to the United States, was inactivated at Camp Kilmer, New Jersey. On 1 Dec 45, USFET took over operational control of all former tactical CIC Teams through the 970th CIC Detachment. In February 1947, the Third Army CIC in Germany consolidated with the 970th CIC Detachment which still had its headquarters in Frankfurt am Main, Deccan. On 20 Jun 48, the 970th CIC Detachment was inactivated. On the same date, it was reorganized and became the 7970th CIC Group. A T/D was authorised under Headquarters European Command (EUCOM), T/D 303-1341-B, effective 15 October 1949. 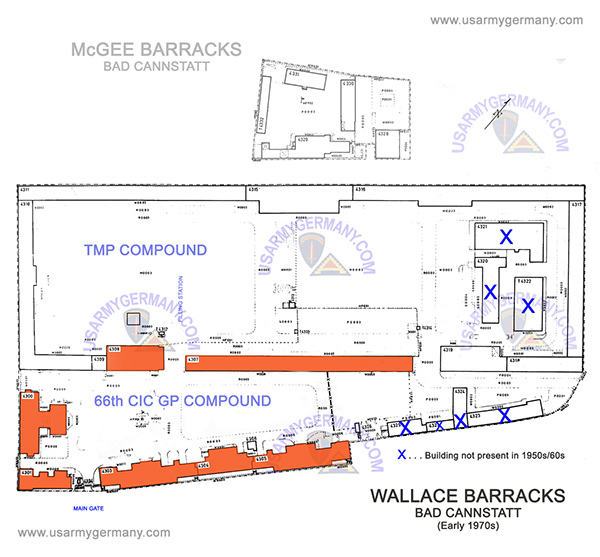 On 29 August 1949, the 7970th CIC Group moved its headquarters to Wallace Barracks, Stuttgart, Germany. 0n 10 November 1949, the 66th CIC Detachment was activated in the United States and assigned to EUCOM. In the Fall of 1949, a request by the 7970th CIC Croup to become a TO/E unit was approved. The change became effective on 10 November 1949 in consonance with EUCOM GO 102, dated 4 Nov 49. The unit designation was changed with this GO to the 66th CIC Detachment. The 66th CIC Detachment was designated a Regular Army Unit on 5 Dec 51. As of 20 December 1952, the 66th CIC Detachment was reorganized and redesignated as the 66th CIC Group, per USAREUR GO 38, dated 8 Dec 52. The new Group undertook the task of completing thousands of background investigations of refugee applicants for immigration to the United States under the Refugee relief Act of 1953. A separate T/D division administering over 700 DAC and indigenous personnel was established to accomplish the mission. On 1 January 1960 the 66th CIC Group was reorganized and redesignated as the 66th Military lntelligence Group. On 25 July 1961 the 66th Military Intelligence Group was reorganized and redesignated the 66th INTC Group (per USAREUR GO 212, dated 18 Jul 61). Much of the work of the Counter Intelligence Corps was performed abroad, as American occupation forces in Europe and the Far East first attempted to root out the remaining vestiges of Nazism and militarism and then faced the task of countering Communist subversion. 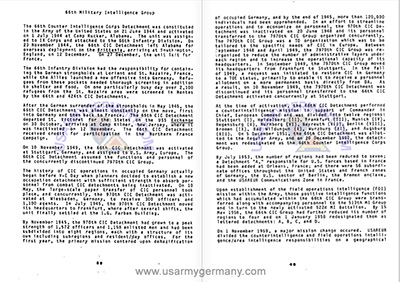 In Germany, all Army counterintelligence assets were consolidated into a single large unit, the 1,400-man-strong 970th Counter Intelligence Corps Detachment, which blanketed the American Zone of Germany with a network of regional and field offices. In 1948 this was converted into the 7970th Counter Intelligence Corps Detachment, organized under a table of distribution (TD) as a one-of-a-kind unit to perform a specific mission. The change brought about difficulties in obtaining personnel, however, and as a result the 7970th was superseded by a new TOE outfit, the 66th Counter Intelligence Corps Detachment, in 1949. Counter Intelligence Corps operations overseas faced their own special problems. Some higher commanders abroad objected to the idea of CIC agents living in civilian clothes apart from the structure of the Army as a whole and sought to remilitarize the operations. At one point, all counterintelligence personnel in Germany were put back into uniform and ordered into Army billets with considerable loss of operational effectiveness. Another problem was that some CIC personnel acclimatized themselves to life overseas all too well and had married foreign wives. In June 1950 the CIC chief issued an order that any CIC member marrying a foreign national without grant of a waiver would be terminated. Finally, operational necessity drew the corps into unfamiliar activities. In Germany, for example, CIC agents helped crack down on the black market. In most overseas commands, Cold War needs forced Counter Intelligence Corps units to engage in positive collection of intelligence. With no mechanism for gathering human intelligence at its disposal outside of the attache system, the Army was forced to misapply its counterintelligence assets to fill the void. NOTE: For Army lineage purposes, the distinction between TOE and TD units lies in the fact that TOE units are permanently placed on Army rolls and are activated and inactivated as needed, whereas TD units are organized on a one-time basis for a particular mission and are not perpetuated after discontinuance. A typical example of a TOE unit would be an infantry battalion, while a typical TD unit would be an Army garrison. Because of the peculiar demands of intelligence work, many intelligence personnel have historically served in TD (later TDA, or table of distribution and allowances) units. One item in the artiocle on the 66th MI Brigade is not quite correct. It states that from 14 Jul 1945 to 29 Aug 1949, the 970th and 7970th operational headquarters were located in the IG Farben Building in Frankfurt am Main, Germany, with the administrative headquarters located in Bad Hamburg, Germany. Actually, the Command Group and Adjutant's section of the HQ, along with the S2/S3 sections and the CIC Central Registry (counterintelligence central files) were in the Farben Building until mid-1948. The S1 and S4 sections were at Camp King in Oberursel, Germany. In 1948 events such as the Berlin Blockade/Berlin Airlift and major currancy reform from Reichsmarks to Deutschemarks, (the latter called Operation Bird Dog) caused creation of an expanded Trizonal Hq for coordination and cooperation between the US, British and French Zone authorities. This Hq was moved into the Farben Building and a number of elements moved out to make room for this, including the newly formed 7970th CIC Group. They, along with the Office of the EUCOM Provost Marshal (then Brig Gen Norman Schwartzkopf, father of "Storm'n Norman" of Desert Storm fame) moved across town to the WAC Circle area of Frankfurt, behind the area of the Main Post Exchange, into a large building called the Commando Building (former HQ of the previous IX Wehrkreis Kommando of the late Third Reich). It was the Commando Building that gave the vaunted 66th CIC Det basketball team their name "66th CIC Commandos". It was from the Commando Building, a year later, that the 7970th moved to Wallace Barracks (the former Grosse Reiter Kaserne) in Stuttgart-Bad Canstadt. This move was again forced by changing conditions in Occupied Germany. At that time there was a competition for the location of the new West German capital. As a contender, Frankfurt was planning to use the Commando Building as the location for the new Bundestag. They even began construction of a very large rotunda wing to that building for that purpose. In the end the bid went to Bonn, but meanwhile, the 7970th had to get out of town - and that is why they ended up in Stuttgart, but from the Commando Builing, not the Farben Building. Region IV, 7970th CIC Group is located at Peterson Kaserne, Munich. I was stationed in the Grosse Reiter Kaserne (Wallace Barracks) from Dec 1954 to May 1956. The unit was listed at the time as 7807 USAREUR Detachment but was actually headquarters for the 66th CIC Group. (Looking at the aerial photo) after you enter the front gate and proceed straight ahead the large building on the left contained the mess hall, the EM club and the library. If you then proceed to the next street and take a right and follow that street for 20/30 feet or so on your left that building was a basketball court and gym. When I arrived in Stuttgart, in late 1959, I was assigned to a numbered USAREUR Liaison Group, the classified cover designation of the 66th CIC Group. I was a CPL E4 when I arrived, and was a 1LT when I departed some four years later. All of my service there was in the USAREUR Central Registry (CR), in the Grosse Reiter Kaserne (GRK) (later renamed Wallace Barracks), in Bad Cannstatt/Stuttgart. It was a very interesting assignment. The CR was composed of divisions/branches, organized around the Central Personality Index (CPI) that consisted of some 5-6 million 5" by 8" cards that indexed all the data in all the files in paper and microfilm that CR maintained. When I arrived, most of the data were in paper files (dossiers), but the CR was engaged in a microfilming project that reduced the paper files to microfilm. The CPI of the CR was composed of cards from several sources. CPI maintained all cards in alphabetical order, and was composed of a large quantity of GESTAPO files, collected as the German armies was pushed back into native Germany. Personalities who came under attention of CIC Agents were reported to CR, and references were created to the data sent to CR for file. One small note about CR, during the Cold War, we had to maintain the capability to evacuate all of CR, which included several hundred cabinets of paper files (dossiers) and CPI cards. Many hours were spent trying to move cabinets of files and cards down the stairs (from the 3rd floor) of GRK. Later, the CR was relocated to the first floor of the main building. This move substantially improved the ability to evacuate the massive amounts of data. The CPI was manned by females who were wives and children of the male servicemen, and some civilians living in Germany at the time. We trained them to make "lookups" in the files, having to look in numerous places due to various spelling of Germanic and other European names. During my assignment in CR, IBM was invited to study our data, files, references, etc., and offer a plan to automate the Registry. They completed the study, made their recommendations, and saw their proposals fall on deaf ears. The Army would not spend money to automate our Registry while the Central Records Facility (CRF), located at Ft Holabird MD, was still a manual operation. CRF was the final home of all data that flowed into CR. During my last year in CR, I proposed that we code CPI, so that it would be easier and more accurate to perform "lookups". This proposal was approved, and we began the conversion with the smallest letter of the alphabet, "y" I believe. Before I left, we had converted all cards in four letters. I visited the CR several years later, and learned that they had completed the conversion. The CPI was able to produce far more work with less people after the conversion. CR and CPI processed requests for information from all the allied intelligence agencies in the USAREUR area. We had a backlog at one time, and made a one-time push to reduce the backlog. In this special push, we were able to process more that 44,000 requests for information. We were not able to maintain the rate, but with the advent of the conversion to the modified Soundex code, better and faster intelligence reports were possible from the data in CR. Unless I am mistaken, it was the 3842 ULG. I suspect that each of the Field Stations had a separate ULG number. I do not remember a 7945th ULG. We called the Oberursel facility (home of the 513th CIC Gp) the "Goat Farm" if my memory is correct. Does that ring a bell with you? The last time I visited there was when I received my commission, a few months before I rotated back to CONUS and Ft Bragg Co B 519th MI Group. Regarding GRK, there were two or three units using the whole kaserne. We used a strip of the kaserne which is located at the bottom of the photo. Our portion paralleled the Neckar River at the bottom, out of the photo. The major portion at the top of the photo was a transportation unit. Some of the trucks we used for evacuation were parked in that portion of the kaserne. There could have been other elements in the kaserne. At the lower left end of the kaserne was a street with strassenbahn (end of the line). Turning up the side at the lower left corner, there was one building and then the entrance we used. The first building was the library and a Field Station in the upper floors. The Guard Shack was just inside the entrance gate. Turning right, the building on the right was the headquarters building. CR was located on the third floor when I arrived, but was located on the ground floor when I left. The last building on the right was the billets. Our motor pool was located in the row of buildings near the center, with most of them used by the transportation people. Continuing up the street (the one with the strassenbahn) the Robinson Barracks was located: PX, Commissary, and housing area. I lived in these quarters part of my stay there. The first years were in Weilimdorf, southwest of Stuttgart. When I made SGT, I was eligible for quarters and moved in. I was in the CIC back in the 1950's. After finishing Language school, I was assigned to the Liaison Group in Offenbach, Germany but after a couple of weeks, I was reassigned to Bad Cannstatt to study German at the 66th Headquarters. Two things to keep in mind. The CIC was effectively dismantled in 1967 with its duties parceled out to other agencies and commands, so these plans and photos, made in 1973, do not quite represent the kaserne as it existed in the 1950's and 1960's. For instance the complex made up of 4323/4324/4325/4327 and 4320/4321/4322 have been added since then. Second: while C.J. remembers the very large area behind 4307 and 4308 as a very large motor pool, he does not make any comment about the other buildings 4310/4311/4315/4316) and I tend to think that the post was a multipurpose post, with those buildings being under a separate command. I think, at the time, the area defined by 4300 around to 4307 and 4308 pretty much was the 66th area. 4300: When you went into 4300 by the door across from the library (Bdlg 4301), you went into the EM Club. When you walked through the club or came in the far door you were in the mess hall. Neither C.J nor I remember the jutting out portion of the building and perhaps that was a later expansion of the mess hall to facilitate a larger number of people. I do seem to remember a very small area of the mess hall being a place to buy toiletries and etc. but C. J. says that the PX and the movie theater were in a complex a couple of miles up the hill from Wallace. I think he was referring to Robinson Barracks area. 4301: A small portion of this building (neither of us can remember if it was upstairs or down stairs) was the post library, with a very nice young lady named “Elsa” as the librarian. The remainder of the building was occupied by the local CIC field office. I was in the library often but only in the field office one time. Having just graduated from the Army Language School where I studied Polish, I and a classmate were asked to help translate a letter in Polish. 4303: according to C.J., this building was rumored to have been the CIA, so I am assuming it was off limits to everyone else. 4304: was the 66th CIC Headquarters building. C.J. says that among other things there were various offices, a Microfilm Library and, in the basement, was a snack bar and the post office. 4305: Now, the rest of the buildings on post were off limits to me with the exception of 4305, which was the enlisted men's barracks, with a laundry, dry cleaners and barber shop in the basement. The very far end of the building there was a large room. The front part of which was used as billets for temporary personnel coming and going from and to other posts. The end portion of the room was closed off by metal lockers and that is where the students of the German class were billeted. 4307: According to C.J., who had a lot of experience with the transportation functions, 4307 was the Motor Pool Office, Service and repair area. I never knew what was in most of the building but the very far right end of it was a couple of class rooms for training. The German class that I attended was at the end of it. 4308: C.J. seems to think that 4308 contained a handball court or says that it was in that general area. So perhaps that was a gymnasium set-up. As I said, I was only there six months and that was in intense eight hour days of studying German. So, I really did not get exposed to that part of the post. That just about wraps up our knowledge but I think it pretty much pin points things as they were in the 50's and 60's. If you have any questions, however. Feel free to ask them. It may juggle our memories even more. Both C.J. and I have actually enjoyed this little journey back to Bad Cannstatt. I was stationed with the 66th INTC Group at the Grosse Reiter - Wallace Barracks and was an Intelligence Coordinator, assigned to work with coordinating and analyzing filed reports from most of the US Army commands along the East German border. Several of us, who were trained at Fort Holabird during the Cuban Missile crisis were assigned to the 66th or the 513th in Frankfurt (Oberursel). I arrived in January, 1963, via troop ship to Bremerhaven and then transported to Stuttgart/BadCanstadt for assignment. Upon arrival and shown our billets, it was apparent that the Kasserne needed some updating. The shower room window was broken and ice and snow covered the floor. Not a pleasant arrival experience. This was an ideal location to be able to catch the Strassenbahn to downtown Stuttgart and it was an easy drive to Munich and Nuernberg. We were restricted from travel to Berlin at that time...as well as to Albania....primarily for security reasons. I was in Bad Cannstadt until April 1965, when I was assigned to the 527th MI Company in Kaiserslautern, working to support field operations. In June I rotated CONUS as an E-5. I would be interested in hearing from anyone stationed there during that period....Larry Thrall, Carlos Vannicola, Dal Lane, George Daily, etc. Danny Johnson is a Reserve captain and is a manpower specialist with the Directorate of Intelligence Resources Management, OACSI at the Pentagon. The 66th Military Intelligence Group began its history on July 1, 1944, when it was activated at Camp Rucker, Ala. as the 66th Counter Intelligence Corps Detachment. The 66th CIC Detachment was attached to the 66th Infantry Division and assigned to IX Corps. The 66th was relieved from assignment to IX Corps and assigned to XXIII Corps in September 1944. The 66th CIC Detachment did not remain long at Camp Rucker. On Nov. 23, 1944, the unit departed for the New York Port of Embarkation at Camp Shanks, New York for overseas shipment. The unit shipped out for England aboard the "Brittanic" arriving in Southampton on Dec. 12, 1944. After a short period of training, the 66th CIC Detachment arrived in France on Dec. 27, 1944. Once in France, the 66th Infantry Division came under the control of the 12th Army Group. The mission of the 66th Infantry Division was to contain the enemy near the St. Nazaire and Lorient pockets. Refugees in these areas needed thorough screening, and food and shelter. The 66th CIC Detachment served in France and Germany until the end of hostilities. After a brief tour of occupation duty the unit departed for Marseilles, France in June 1945. The 66th Infantry Division was assigned the task of guarding the staging areas while troops returned to the United States. Finally, the 66th CIC Detachment departed France aboard the "USS Exchange" for the United States on Oct. 30, 1945. The unit arrived at the NYPE on Nov. 10, 1945 and was inactivated at Camp Kilmer, New Jersey two days later. The 66th GIG Detachment is credited with participation in the Northern France campaign during World War II. 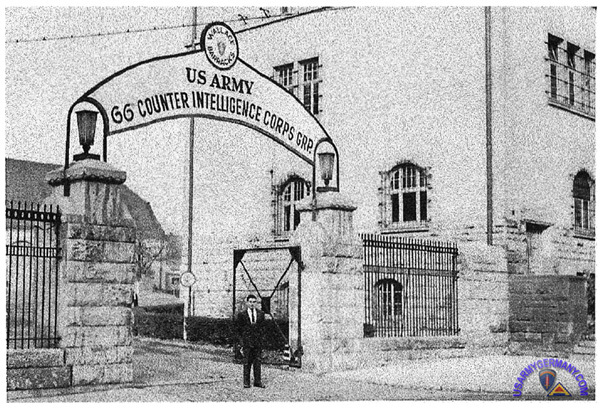 The 66th CIC Detachment was reactivated in Stuttgart, Germany, on Nov. 10, 1949, and assigned to U.S. Army, Europe. The 7970th CIC Group was discontinued and the 66th CIC assumed its functions and personnel. 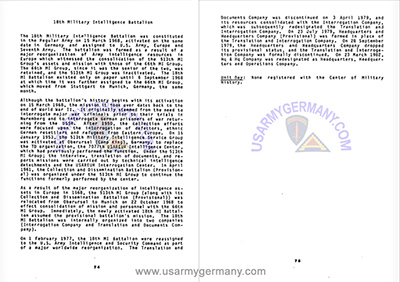 Upon activation, the mission of the 66th was to perform counterintelligence for the Commander-in-Chief, European Command. The organization was divided into 12 Regions. 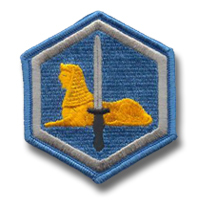 The 66th CIC Detachment was reorganized and redesignated in December 1952 as the 66th Counter Intelligence Corps Group and remained assigned to U.S. Army, Europe. By July 1953, the 12 Regions had-been reduced to seven. In December 1955, the 66th Group was temporarily designated as the 7945th USAREUR Liaison Group which later became the U.S. Army Liaison Group Europe which was deactivated in January 1960. The 66th Group was never really redesignated. In May 1956, the 66th Group was further reduced from 7 Regions to 4. In January 1958, the 4 Regions became Detachments A, B, C, and D.
In November 1959, USAREUR divided the counterintelligence and field operations intelligence/area intelligence missions on a geographical basis between the 66th Group and the 513th MI Group. The 513th Group had the area of northern Germany including Berlin and the 66th had the southern area of Germany. In January 1960, the 66th reorganized and redesignated as the 66th Military Intelligence Group. In July 1961, the 66th MI Group was redesignated the 66th Intelligence Corps Group. The 66th was again designated the 66th Military Intelligence Group which remained assigned to U.S. Army, Europe and Seventh Army. Due to reorganizations and consolidation of intelligence resources in Europe, the 66th was relocated from Stuttgart to Munich in September 1968. Between 1968 and 1969, the 66th took over the personnel and missions from the 513th MI Group. The formal inactivation of the 513th took place on June 25, 1969 at Munich. The 66th took over the facilities formerly held by the 513th in Munich. The 66th MI Group was relieved from assignment to U.S. Army, Europe and Seventh Army and was assigned to U.S. Army Intelligence and Security Command in February 1977, as part of a worldwide reorganization of Army Intelligence resources. 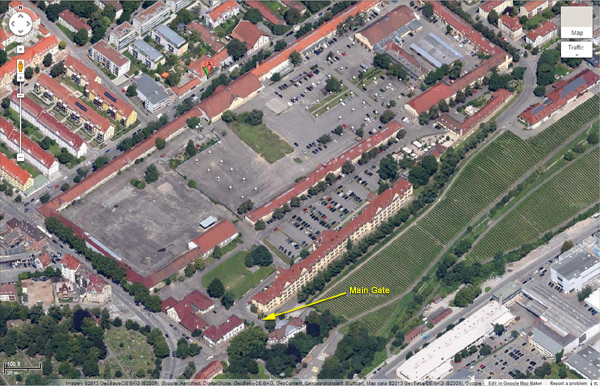 Headquarters, 66th MI Group is currently located on McGraw Kaserne in Munich. Elements of the 66th MI Group are located in 63 cities in eight European countries. Units assigned to the 66th MI Group include the 18th Military Intelligence Battalion also located in Munich. The 511th Military Intelligence Battalion is located in Nuremberg with elements in Northern Bavaria and Baden Wuerttemberg. The 527th Military Intelligence Battalion is headquartered in Kaiserslautern. Detachment D, 66th MI Group is stationed at Caserma Ederle in Vicenza, Italy. The 165th MI Battalion is located near Frankfurt. The 766th MI Detachment is located in West Berlin. 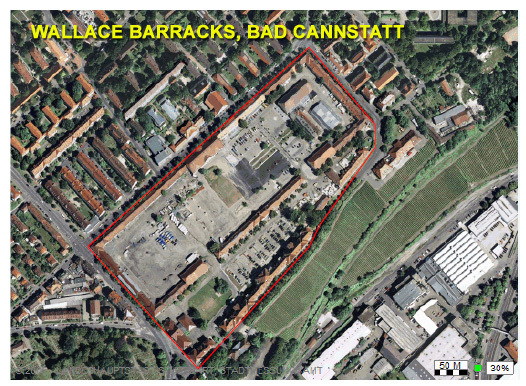 The 502d Intelligence and Security Battalion is located on Flak Kaserne in northwest Augsburg. In a letter to the editor of Military Intelligence, a reader added the following information to the above history. The article "History of the 66th MI Group" in the April-June issue of Military Intelligence is essentially correct in the main points despite some small errors and ommissions. The final regional structure of the 66th MI Group consisted of five, not four, regions (I, III, IV, XI and XII). 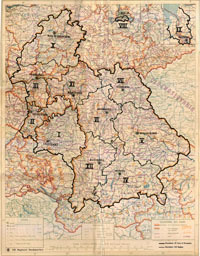 Region XII relocated from Augsburg to Kaiserslautern following the Peace Treaty and assumed responsibility for Rheinland-Pfalz (formerly a part of the French Occupational Zone). The five regions were subsequently re-designated Field Stations (with the same numbers) until July 1962 when they became, respectively, the 6th, 165th, 503rd, 511th and 527th MI Companies. Later transfer of the 6th MI Company to Fort Meade, Md., and inactivation of the 503rd MI Company left the three that today carry "battalion" designations. Another present group unit which historically descends from the old region structure is the 766th MI Detachment. In the early 1950s, Region IX (Bremen) relocated to Orleans, France, and assumed support for Headquarters USAREUR COM-Z. Its former AOR was absorbed by Region X (Bad Wildungen). Region IX was later redesignated the 766th CIC (later MI) Detachment and returned to Germany when USAREUR COM-Z was disestablished in 1966. The many reorganizations, administrative designations and changes of operational control (and missions) of the 66th MI Group have been far too numerous for any brief history, but they have resulted from, or in, many lessons learned (and sometimes re-learned) over the long years. A full operational history would fill a very large book that would be very instructional for those in the HUMINT field. I appreciate the article and would like to see future articles on the other groups and battalions, including illustrations of their insignia. Time period for this aerial view of McGraw Ksn, Munich, home of the 66th MI Gp, has not been established yet. The 18th MI Battalion traces its history back to the closing days of WWII. In the spring of 1945, the U.S. Army took control of DULAG LUFT, just outside of FRANKFURT (OBERURSEL). During the war, this camp was used as a German Interrogation Center for captured Allied Air Force personnel. On Sep 19 1946, the compound was renamed Camp King in honor of Col. Charles B. King and placed under the control of HQ 7707th EUCOM Intelligence Center. The Collection and Interrogation Battalion (C&I Bn), one of several units assigned to the camp, was tasked with its first post-war mission: debriefing major German war criminals prior to their trials at NÜRNBERG. Later, the C&I Bn was tasked with debriefing German POW's returning from captivity in the Soviet Union. In Mar 1966, the unit was redes the 18th MI Battlion. Two years later it was reassigned to the 66th MI Gp and shortly thereafter relocated from OBERURSEL to MUNICH. 18th Military Intelligence Battalion operated the Joint Interrogation Center in Germany. There the unit gathered tactical and strategic information from all border crossers and other human sources. 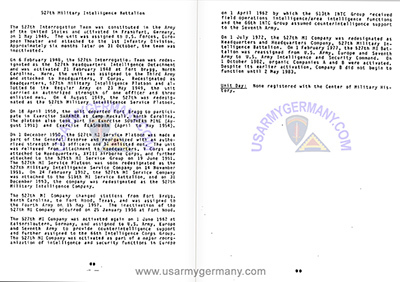 511th Military Intelligence Company - Gary Behymer 's memories page for former members of the 511th MI Company (Fürth, Germany). 18th Military Intelligence Bn Forum - this forum is dedicated to all the former 18th MI Bn Cold War Warriors. The purpose of the site is to renew contacts, share memories, and to serve as a meeting place for those of us that lost contact over the years.